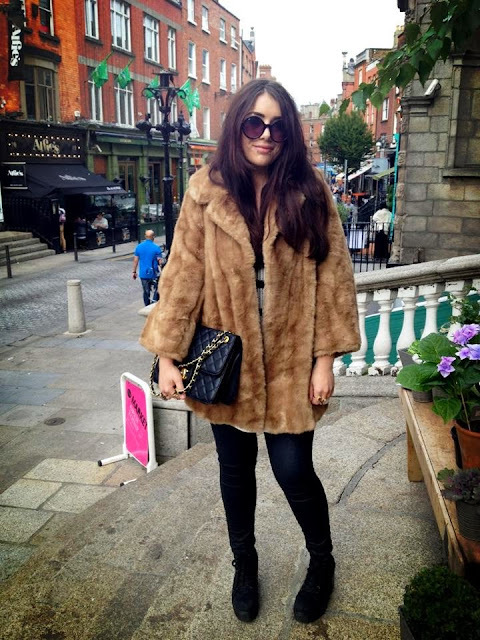 Holly Shortall is fast becoming a very well known name in the Irish fashion industry. Holly is a 24 year old Dub who is an extremely talented Fashion illustrator. Her career to date has seen her featured in Ooh LaLa Magazine, The Irish Examiner and U Magazine, to name a few. I luckily came across her facebook page a few months back after she did some personal illustrations of fellow Irish Bloggers that I follow. Firstly, how & when did you start fashion illustration? I’ve been drawing since I was about 3 years old, but only started using Photoshop to colour them in March. When I started doing personalised illustrations, that’s when it really kicked off! Who are your favourite illustrators? Who inspires you? Peter O’Brien, the fab Irish designer, is an amazing illustrator. I wish I gotten my hands on a copy of his book a few years back! What qualifications did you get to do what you do, if any? I literally have no qualifications, which is embarrassing! I was lucky enough to get a lucky break by appearing on a TV show a few years ago which kicked off my career as a Visual Merchandiser. Some people in the Irish Fashion industry would remember me from the show so that’s good with regard to profiling/networking. Who is your current fashion icon? Ooh that’s a tough one. I’ve been living in a bubble of sparkle and glitter for the last month working in Clerys doing the windows with freelance display company Visual Sense, so I haven’t be paying too much attention to whats going on in the fashion world! What is your favourite trend at the moment? I’m Faux Fur obsessed at the moment. Loving that paired with leather jeans and biker boots. Your career as an illustrator is most definitely on the up. How has the journey been so far? What have been the highlights & the lowlights? Its been a bit mental because I had this plan in my head from about June that I was going to go back to college to study fashion design, but then people started wanting illustrations so I didn’t need to go back to college! I cant really think of any lowlights other than I had an accident in wok two years ago where something fell on my back and there has been days when its been so sore I’ve just had to stay in bed! So that was something that really worried me as I would hate to be feeling that all the time. Who has been your most famous client so far? I have some cool collaborations coming up with Helen Steele, designer worn by Jessie J, Rita Ora and many more. Saoirse Ronan is a fan too which is amazing! How do you even go about doing an illustration & how long does one typically take? If I’m doing a celebrity illustration, I just go for it and 9 times out of 10 don’t even have to look at a photo! I just do them for fun for my social networking pages- you never know who might see. Personalised illustrations can take up to an entire day to do. I needs lots of photos and its important that personality comes across in the illustrations. They’re hand drawn and then scanned, then coloured in on Photoshop. What are the top three products you couldn’t live without!? Vichy Dermablend foundation, Mac Studio Fix powder and my eyebrow powder. What is your signature lip colour? Its a toss up between red and bright pink. How do you maintain your gorgeous complexion!? I wear a lot of foundation! I have really freckly uneven skin, so I honestly just wear probably twice as much foundation as I should. What is your ‘MUST DO’ beauty tip? Filling in your eyebrows. Its such a must. I look at photos of myself only two years ago and my eyebrows .. I just cant even talk about it. I keep meaning to book in to get HD Brows by MUA Kim O’Sullivan in Preen Hair and Beauty. Her before and after pics are insane. Have you any advice you can offer young aspiring illustrators? Or someone who is hoping for a career in the fashion industry? I honestly think if you’re in a position where people are telling you your fab and your getting requests for commissions, and you have no kids/mortgage/loans etc. and are in a position to go part time in your job, then just do it. You have to take risks in your life! What’s next? Give us an insight into the goals you wish to achieve and where you see yourself in the next 5 years. I feel like theres many avenues I can explore, such as weddings, gift cards, personalised merchandise etc, but my real big dream would be to do celebrity or fashion illustrations for the Holy Bible aka American Vogue. Ill keep dreaming!! With commissions including Stylists Annmarie O’Connor & Angela Scanlon, Grace Moore and Courtney Smith, and designer Joanne Hynes and fans including Imelda May and Saoirse Ronan, this lady is definitely going places and is one to watch. To follow her amazing work or to commission your own illustration, you can contact Holly on facebook or via hollyshortall@gmail.com. I personally can’t wait to get my own. It will have pride of place in the new Innocent Illusion headquarters.